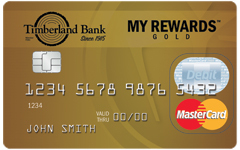 Using the My RewardsTM Gold Debit Card for everyday purchases can be very rewarding! Now, it's even easier to earn more valuable items in your rewards program. Each purchase you make with the My RewardsTM Gold Debit Card, will earn you TRIPLE the points you are used to earning. Remember, 100 points is all it takes to get a gift at the first level! You may redeem right away or save your points for bigger, better rewards in the future. To view all the available rewards, log in or create an account at www.timberlandrewardsplus.com and click "Rewards". Misplace your card? Get a replacement quickly and easily by calling (855) 314-8030. Shop online through the rewards website and earn cash back for your purchases. More than 100 of your favorite online shopping sites participate. Earn as much as 3.75% cash back from online merchants like Walmart®, Best Buy®, Office Depot® and more! Cash back amounts vary by retailer. If you have a Gold or Platinum Debit Card, log in to your account at www.timberlandrewardsplus.com and click "Shop Online". With the My RewardsTM Gold Debit Card, you'll earn bonus rewards points when you shop online through the rewards website. With more than 100 of your favorite online shopping sites, earning bonus points has never been easier. If you did all of your shopping online, imagine how close you could be to an iPod®, a plasma TV, a Caribbean Cruise, or even a new car! Bonus points amounts vary by retailer. If you have a Gold or Platinum Debit Card, log in to your account at www.timberlandrewardsplus.com and click "My Rewards Card" and "My Area Deals". The My RewardsTM Gold Debit Card provides numerous services when traveling, including emergency private medically-required transportation, medical assistance services, and family and personal travel assistance services. Maximum benefit amount is 25% of Covered Expenses up to $200,000 per Eligible Person per trip. To request assistance, please call 855-314-8030. My RewardsTM Rx Savings Card offers prescription savings for you and your family. Pharmacy and Member Help Desk: (855) 314-8030. If you have a Gold or Platinum Debit Card, log in to your account at www.timberlandrewardsplus.com and click "Rx Savings Card." To request assistance, please call (855) 314-8030. If you have a My Rewards Debit Card, sign in to your account at www.timberlandrewardsplus.com and click "My Rewards Card" and "Hotel/Car Discount Codes". Using the My RewardsTM Platinum Debit Card for everyday purchases can be very rewarding! Now, it's even easier to earn more valuable items in your rewards program. Each purchase you make with the My RewardsTM Platinum Debit Card, will earn you FIVE TIMES the points you are used to earning. Remember, 100 points is all it takes to get a gift at the first level! You may redeem right away or save your points for bigger, better rewards in the future. Shop online through the rewards website and earn cash back for your purchases. More than 100 of your favorite online shopping sites participate. Earn as much as 5% cash back from online merchants like Walmart®, Best Buy®, Office Depot® and more! Cash back amounts vary by retailer. If you have a Gold or Platinum Debit Card, log in to your account at www.timberlandrewardsplus.com and click "My Rewards Card" and "Rx Savings." With the My RewardsTM Platinum Debit Card, you'll earn DOUBLE rewards points when you shop online through the rewards website. With more than 100 of your favorite online shopping sites, earning bonus points has never been easier. If you did all of your shopping online, imagine how close you could be to an iPod®, a plasma TV, a Caribbean Cruise, or even a new car! Bonus points amounts vary by retailer. The My RewardsTM Platinum Debit Card offers 24-hour roadside assistance, seven days a week, 365 days a year. This coverage consists of up to three events per year at $100 each. Whether you need a tow, a battery jump, fuel delivery, winching or a tire change, you're covered. Access to a convenient 30-day loan is easier than ever! You may be eligible to have instant access to cash to help you manage unexpected expenses. There are no hidden fees and no down payment required. If you have a Platinum Debit Card, log in to your account at www.timberlandrewardsplus.com and click on "My Rewards Card" and "Loans". If you have a Gold or Platinum Debit Card, log in to your account at www.timberlandrewardsplus.com and click "Rewards". Using the My RewardsTM Business Platinum Debit Card for everyday purchases such as fuel, business meals and office inventory can be very rewarding! Now, it’s even easier to earn more valuable items in your rewards program. Each purchase you make with the My RewardsTM Business Platinum Debit Card will earn you FIVE TIMES the points you are used to earning. Remember, 100 points is all it takes to earn a gift at the first level! You may redeem right away or save your points for bigger, better rewards in the future. If you have a Gold, Platinum or Business Platinum Debit Card, log in to your account at www.timberlandrewardsplus.com and click "My Rewards Card" and "My Area Deals". Shop online through the rewards website for business supplies or personal needs, and you’ll earn cash back for your purchases. More than 100 popular online shopping sites participate, including categories for business gifts & entertaining, office renovation, technology, car rentals & travel, office supplies, and more! If you have a Gold, Platinum or Business Platinum Debit Card, log in to your account at www.timberlandrewardsplus.com and click "Shop Online". 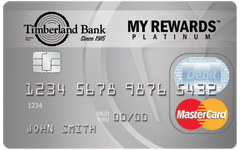 If you have a Gold, Platinum or Business Platinum Debit Card, log in to your account at www.timberlandrewardsplus.com and click "My Rewards Card" and Rx Savings"
With the My RewardsTM Business Platinum Debit Card, you'll earn DOUBLE rewards points when you shop online through the rewards website. With more than 100 popular online business and personal shopping sites, earning bonus points has never been easier. If you did all of your shopping online, imagine how close you could be to earning new electronics for the office, travel bags and luggage sets, even a Caribbean cruise when you need a much-deserved break from work. The My RewardsTM Business Platinum Debit Card provides you with an extended warranty for eligible purchases (up to $10,000). This warranty doubles the original U.S. manufacturer warranty and any purchased warranty up to a maximum of 12 months. The My RewardsTM Business Platinum Debit Card provides numerous services when traveling, including emergency private medically-required transportation, medical assistance services, and family and personal travel assistance services. Enjoy savings on business rental car use & hotel accommodations on widely-used, recognized brands across the country. If you have a Business Platinum Debit Card, log in to your account at www.timberlandrewardsplus.com and click "My Rewards Card" and "Hotel/Car Discount Codes". The My RewardsTM Business Platinum Debit Card offers 24-hour roadside assistance, seven days a week, 365 days a year. This coverage consists of up to three events per year at $100 each. Whether you need a tow, a battery jump, fuel delivery, winching or a tire change, you’re covered. My RewardsTM Business Platinum Debit Card holders may be eligible to receive reimbursement (up to $1,000) for eligible items that are damaged or stolen within 90 days of purchase. Enjoy rewards at each level of the program that are reserved exclusively for My RewardsTM Business Platinum Debit Card holders. Electronics, special vacation packages and other high-end items will be available only to you. Periodically, we may offer special invitations to events that are only open to My RewardsTM Business Platinum Debit Card holders. As those events arise, additional information will be made available. If you have a Gold, Platinum or Business Platinum Debit Card, log in to your account at www.timberlandrewardsplus.com and click "Rewards". When travel is charged to card holders’ Business Platinum Debit Cards, they (and any eligible family members) are automatically insured up to $100,000 against accidental loss of life, limb, sight, speech or hearing occurring on a common carrier covered trip. Download My Rewards FREE app today for your iPhone®, iPad® or AndroidTM devices. Access the benefits of your My RewardsTM Business Platinum Debit Card through your mobile phone with a direct link to your rewards account. Access to certified technicians 24x7 to keep card holders’ smartphones, tablets, computers, and networks running. Remote support allows users to get technical problems resolved immediately and affordably, without having to visit a repair shop or wait for a technician to visit their home. Congratulations on your decision to sign up for a My Rewards™ Gold, Platinum or Business Platinum Debit Card! If you already have a www.TimberlandRewardsPlus.com account, please log in and select Card Settings from the My Rewards Card menu.